I have been practicing bankruptcy law since 1991. I have seen a drastic difference in the way that student loans are handled in bankruptcy cases. Prior to 1998, a student loan was potentially dischargeable if it had been in repayment status for more than seven years. This basically meant that an old student loan debt could potentially be discharged. Oftentimes, if a student loan debt was in repayment status for more than seven years, then the lender either received a portion of the loan back or the debtor was simply not in a position to repay at all. For these debtors, the ability to discharge a student loan that was more than seven years in repayment status was a great benefit. It really depicted what a fresh start really is. The debtor would be allowed to eliminate an old student loan as well as the typical credit cards, medical bills, personal loans and other miscellaneous debt. After the law change, the amount of time that a student loan was in repayment status no longer mattered. The only thing that mattered was whether or not the loan was for an educational purpose and provided by a governmental entity. I write this article with the knowledge that there is an effort underway in the United States Congress to change the way that student loans are treated under the bankruptcy code. 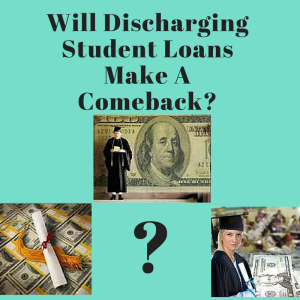 There is a growing movement to go back to the time when a student loan was potentially dischargeable. There is even talk about shortening the time frame for when a student loan could potentially be discharged. There has to be a balancing act between the lending of money and the ability to discharge the debt. I believe it would be an unfair result to allow for student loans to be discharged at any time. This would lead to a chilling effect on lending in that someone can turn around immediately after getting the benefit of the loan and then file bankruptcy. There must be a timeframe in my opinion whereby the lender has the right to collect on the debt. Today, we handle nondischargeable student loan debt through a chapter 13 reorganization case. We are able to pay less than what is owed on the student loan over a three to five-year period, however, there is no discharge of the debt. We are basically providing a form of relief for a three to five-year period whereby the debtor can pay less than what’s owed to the student loan by way of reorganization. At the end of the bankruptcy case under chapter 13, the debtor would owe the balance of what was not paid to the chapter 13 plus interest. Perhaps, if the Congress takes decisive action in the next year or two, we can eliminate student loan debt again instead of simply reorganizing it.